Davy’s research division has revised its forecasts for Irish economic growth down as the global outlook deteriorates. File photo of the IFSC. AS CONSUMER SPENDING falls and families continue to save at a greater rate, Davy has lowered its forecasts for Irish economic growth in both 2011 and 2012. 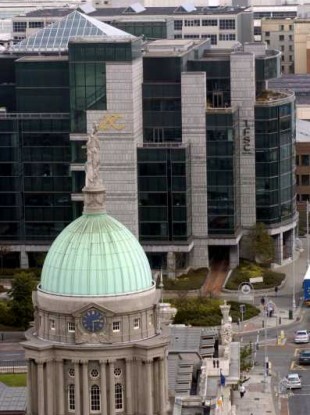 The financial services group now expects Irish GDP to grow by just 1.1 per cent this year and 1.7 per cent next year. This is a significant downward revision on previous projections of 1.6 per cent and 2.4 per cent growth. “We have revised down our growth forecast for the Irish economy (our last projections were in March) given the ongoing weakness in domestic demand and the deterioration in the prospects for the global economy,” the company said in a research note this morning. Its forecasts for GNP (GDP plus total capital gains from overseas investment minus income earned by foreign nationals in Ireland) are for growth of just 0.2 per cent in 2011 and 1 per cent in 2012. Davy said the key factors behind the downside revision is the projected weaker demand for Irish exports and a sharp fall in domestic consumer spending. “Since our last forecast, consumer spending has fallen very sharply. Irish households appear to have increased their saving despite the negative impact of the Budget 2011 tax increases on their real incomes,” said the report’s author Conall MacCoille. Weakened consumer confidence since the negotiation of the EU/IMF funding package in December has led consumers to increase their precautionary emergency saving. With confidence still weak, a significant reduction in high household savings remains elusive. Although the report noted that Irish export growth remains “robust”, it added that prospects appear less favourable now because of the slowdown in the past two quarters in the euro area, the UK and the US. “Given the highly specialised nature of Irish exports, they may continue to perform relatively well in spite of weak global demand. Nevertheless, we expect export growth to slow to 5.7 per cent in 2011 and 4.9 per cent in 2012,” the company explained in its commentary. In the gloomy outlook, Davy also said that there is a risk of further revisions due to the potential of a more severe global downturn. “With the global economic environment deteriorating, the risks to the public finances are clearly on the downside,” continued MacCoille. The economist made the case for more “aggressive action” to reduce the public sector pay bill, including cuts in wage levels, so that the government can aim to “overachieve” on its fiscal consolidation plan. Email “Davy lowers forecasts for Irish economy”. Feedback on “Davy lowers forecasts for Irish economy”.